Well I SURVIED the 1st week of school! It is hard to get back in the swing of things. However, I sure do love all of the fun activities that we get to do during the first weeks. We had so much fun this week!! I have 18 sweet kiddos this year! 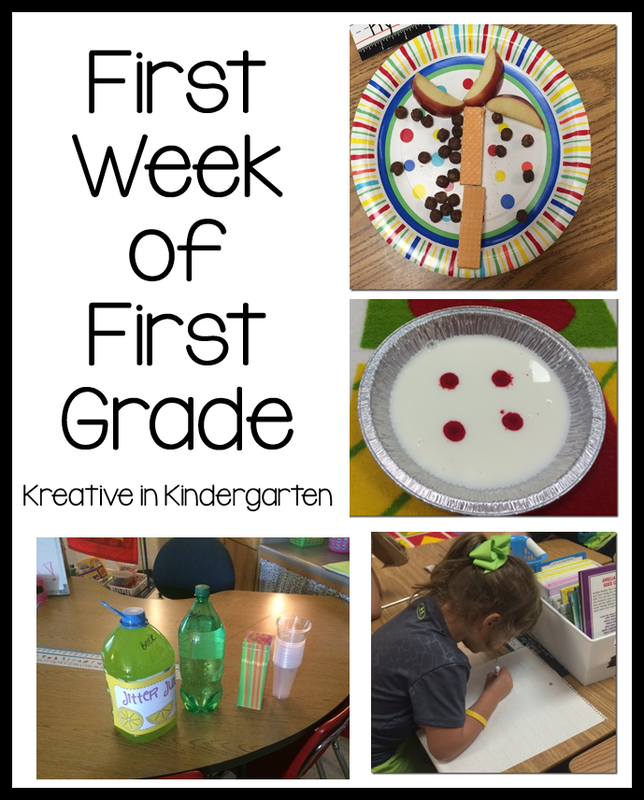 I am going to show some highlights of the first week. Of course this is not everything we did, but some of my favorite moments. When the kids walked in on the first morning I ha my “Hooray for 1st grade!” coloring sheets. Get it for FREE here! This gave me time to greet students (and parents) and get things put away. We practiced making a quiet line to go to the bathroom, lunch, etc. They were quite impressive! Then we made Jitter Juice just to make sure we weren’t nervous about first grade. We complete a graph about whether we liked the juice or not. We ALL loved it! You can check out my Jitter Juice product here! Later, we wrote about how to make the juice. It was lights off and quiet writing time. My favorite time of the day. Then I introduced Brain Breaks from GoNoodle!! They were in LOVE and they asked to do more throughout the week. On the second day we read The Kissing Hand and learned all about Chester. We traced our hand (with a heart in the middle) to remember that our parents are thinking of us too! See my whole unit here! the afternoon was all about sharing our “All About Me” bags! Check out my All About Me Bag product here! I sent home bags and a note on Monday that explained for all students to place on item in the bag that would tell us something about them. This is my bag! Wednesday we dove into Writer’s Workshop (Lucy Caulkin) and they did so well! Here are two students sharing their writing. In Science, we learned about what scientist do and making predictions. I placed some mystery items (dried beans, beads, cotton balls, and straws) in a bag that was stapled shut. They had to feel to make a prediction about what was inside. They worked as a group to write down their predictions. On Friday we completed a first ever Science experiment! They were so excited! We did the milk experiment from Kristen Smith. She has some awesome stuff!! I won’t give too much away, but it was pretty cool!! On Friday we also did some fun Chicka Chicka Boom Boom activities! When your table looks like this, at the end of the day, you know you had an awesome first week!